PASADENA, Calif. (Dec. 29, 2012)  Even if they aren't playing a tune, you will hear them coming. The Pride of the Dutchmen Marching Band  representing MOC-Floyd Valley High School from Orange City, Iowa  will march the entire 5.5-mile Rose Parade route wearing traditional wooden shoes from Holland. Drum major Andrew Schuiteman explained that the shoes always generate a great response from the crowd. "From a distance they can hear the shuffling of the shoes, but they don't know what it is," Schuiteman said. "When you get closer and they see you're marching in wooden shoes, they freak out. The overall crowd response is one of uproar almost. It really makes them excited." 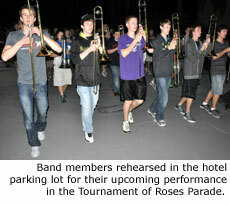 For most of the wooden shoes, the 2013 Tournament of Roses Parade will be their one and only performance. The soft wood required to carve the unique shape will gradually wear down along the parade route. Although the soles are thick enough to last the entire parade route, it's possible that some holes will begin to appear by the parade's end. "The bottom gets sanded off by the rough pavement as the shoes go down the street," explained band director Steve Connell. "What's really unique is that a cloud of sawdust rises behind the band." Since the shoes are essentially blocks of wood with no flexibility, the band uses a different march style than other bands. "It's a physically difficult thing to do, because you're actually pushing the shoes down the street," Connell said. "You can't lift your feet up because there's no give in the top of the arch. I don't have to teach the students how to march in the shoes. When the freshmen come in I just let them try the shoes and after about ten steps they have it figured out." 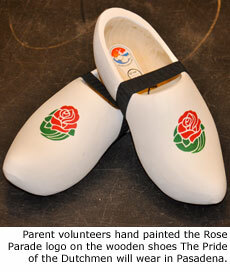 The wooden shoes were imported from the Netherlands, and then 20 volunteers hand painted the Tournament of Roses logo on each of the 360 individual shoes that will be used in the parade. Dianne Van Wyk and Diana Van Ravenswaay are two of the parents who helped paint logos on the shoes, a process that took volunteers about 260 hours to complete. "Stenciling and painting was more complicated than it sounds, because of the curve of the shoe," Van Ravenswaay said. "We traced the template with a mechanical pencil, applied the paint, and sanded lightly to make them smooth." Leaving no detail undone, the crew even used different stencils depending on the size of the shoe. Bigger shoes got a bigger rose. Before the shoes are used in the parade on Tuesday, students will be given a piece of foam and they will go to work customizing their shoes for the best fit possible. "They don't make them for comfort," Schuiteman said with a smile. Van Wyk said her daughter's recipe for comfort involves multiple layers. "We usually make sure she has enough socks on, about three pairs, and we put padding between the layers of socks," Van Wyk said. "We also put padding on top of the foot for a little more cushion and a snug fit." Connell has brought his band back to Pasadena for the second time, after first appearing in the Rose Parade exactly 20 years ago. He smiled broadly as he talked about the community and administrative support that has enabled the band to provide this trip of a lifetime for the students. "We come from a rural town of 6,000 people. We raised $300,000. This trip is completely self-funded so it didn't cost the school a dime," Connell said. MOC-Floyd Valley Senior High School has a total enrollment of less than 450 students in grades 9 through 12. With band membership usually ranging between 170 and 190 members each year, the Pride of the Dutchmen Band includes roughly 40% of the entire student population. This means the band members are the same students who play on the school's championship volleyball team and the highly ranked boys and girls basketball teams. "We have a group of teachers, coaches and administrators who all strive for excellence in everything they do," Connell said. "We all make accommodations for each other so we can take these excellent kids who do everything really well and include them in our programs. In a small town, this is what really makes it work." The community of Orange City (population 6,100) is accustomed to hearing the band's clack of wooden shoes. The band marches in six local parades each May during the annual Orange City Tulip Festival. The festival pays tribute to the Dutch heritage of the region, where immigrants from the Netherlands settled in the late 1800s. There's no question that the Dutch heritage is thriving in Orange City. Van Ravenswaay joked, "The 'V' section is a large part of our telephone book!" Catch the Pride of the Dutchmen marching band on the live broadcast of the Pasadena Tournament of Roses Parade beginning at 8:00 AM (Pacific) on Tuesday, January 1. The band is unit #14 in the parade and will appear within the first twenty minutes. Follow along with the 2013 Rose Parade lineup.